Scientists at the Institute for Material Research found a new method to substantially improve the properties of superconducting wire. The High Field Laboratory for Superconducting Materials research group lead by Associate Professor Satoshi Awaji and Professor Kazoo Watanabe repeatedly bent (prebent) the practical Nb3Sn superconducting wire, used in many superconducting magnets, to demonstrate a world-first, interesting result. The phenomenon was verified on coil shapes, indicating that the method can be used for practical superconducting application. 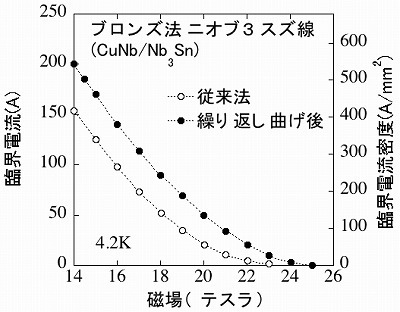 Generally, the superconducting properties of the brittle Nb3Sn wire are known to deteriorate dramatically with the slight deformation. For this reason, these properties are reduced by thermal strain, which is produced when the wire is cooled as low as -269 °C. However, researchers discovered that the superconducting properties can actually be improved sharply by prebending the Nb3Sn wire. The interesting finding suggests that prebending is equivalent to training the Nb3Sn wire, which is essentially weak against distortion, to improve superconducting properties, thus challenging the accepted notion. The new finding will be likely to increase the performance and reduce the cost of superconducting application using Nb3Sn superconducting wires.